“I gave the prescribed Metropolitan Police “first greeting”. “Oi!” I said “What do you think you’re doing?” ― Ben Aaronovitch, Midnight Riot “’Conflict resolution,’ said Nightingale, ‘Is this what they teach at Hendon these days?’ ‘Yes, sir,’ I said. ‘But don’t worry, they also teach us how to beat people with phone books and the ten best ways to plant evidence.’” ― Ben Aaronovitch, Midnight Riot First, I love British Urban Fantasy. It is often quirky, normally presented in a dry, witty style, and sometimes simply figuring out the language can give it a while other level of subtle humour not found in “American English” writing. 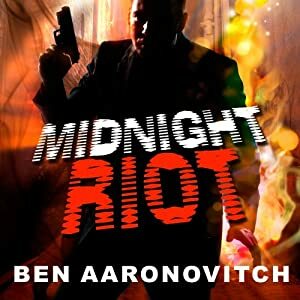 I love it, and Ben Aaronovitch doesn’t disappoint with “Midnight Riot”. Of course, listening to the book rather than simply reading it added a whole other level to my enjoyment. The narration of Kobna Holdbrook-Smith is everything I could have wanted and more. His delivery has the level of dry wit, spot-on delivery and subliminal snark that brings a ‘good’ book to the level of ‘brilliant’. Peter Grant is a London ‘copper’ – just off his two year probationary period as a constable, his lack of ability to actually pay attention to what is going on around him has him scheduled for – basically a fancied up secretary. But one cold night on a scene watch under the West Portico of St. Paul’s at Covent Garden, Peter meets an odd little man in an Edwardian smoking jacket: “…don’t ask me why I know what an Edwardian smoking jacket looks like: let’s just say it has something to do with Doctor Who and leave it at that.” That in itself is weird enough. But the fact that he is a ghost is just a tad over the top, even for a Londoner. Suddenly, Peter finds himself in a world he never knew existed – where ghosts and goulies, goddesses and monsters all exist just below the everyday hustle and bustle of the crowded city streets. In his new position as assistant and student wizard under the tutelage of Detective Chief Inspector Thomas Nightingale. Thomas Nightingale, London Detective and Wizard. Well, nobody ever said being a London cop is simple, you know. Now, there are all sorts of odd things going on around Peter – and all of his friends, his family, and his coworkers, as well as the whole population of London, are in more danger than he ever could have imagined. Peter Grant is an unusual character. Half white, half Somali, Peter suffers the same sorts of issues that any black man in a mostly white force suffers. He likes his job, but his fuzzy grasp on concentration causes him issues – issues that his Probationary partner, Leslie May, has to pick up the slack on. And of course, the oddity of his new position causes a strain for him within the department, as does the bureaucracy inherent in a huge, ancient city such as London. “As soon as we stopped sleeping with our cousins and built walls, temples and a few decent nightclubs, society became too complex for any one person to grasp all at once, and thus bureaucracy was born. A bureaucracy breaks the complexity down into a series of interlocking systems. You don’t need to know how the systems fit together, or even what function your bit of the system has, you just perform your bit and the whole machine creaks on.” Midnight Riot is amazingly creative. Ben Aaronovitch takes the trouble to weave in the history and stories of London, all the way back to its very beginnings, Londinium, a settlement established on the current site of the City of London around AD 47. The focus of the story interweaves history and mythology, witchcraft and ghosts, and Mother and Father Thames and their children, the many other waterways of Britain. As Tim from Temecula says in his Audio review, “It’s as British as Chicken Vindaloo or Soccer Violence.” Of course, as a former Brit, Tim should know – 😉 Idiosyncratic and wickedly fun, the Peter Grant Series is an absolute blast. I can highly recommend it! Especially if you listen to the Audio Version narrated by Kobna Holdbrook-Smith. Awesome! About the Author: Ben Aaronovitch was born in 1964. He had parents, some brothers, some sisters and a dog named after a Russian cosmonaut. He also had the kind of dull childhood that drives a person to drink, radical politics or science fiction. Discovering in his early twenties that he had precisely one talent, he took up screenwriting at which he was an overnight success. He wrote for Doctor Who, Casualty and the world’s cheapest ever SF soap opera Jupiter Moon. He then wrote for Virgin’s New Adventures until they pulped all his books. Then Ben entered a dark time illuminated only by an episode of Dark Knight, a book for Big Finish and the highly acclaimed but not-very-well-paying Blake’s 7 Audio dramas. Trapped in a cycle of disappointment and despair Ben was eventually forced to support his expensive book habit by working for Waterstones as a bookseller. Ironically it was while shelving the works of others that Ben finally saw the light. He would write his own books, he would let prose into his heart and rejoice in the word. Henceforth, subsisting on nothing more than instant coffee and Japanese takeaway, Ben embarked on the epic personal journey that was to lead to Rivers of London (or Midnight Riot as it is known in the Americas). At some point during the above, the most important thing in his life happened and he became a father to a son, Karifa, whom he affectionately refers to as ‘The Evil Monster Boy’. The Evil Monster Boy will be reaching university age soon, so all donations will be gratefully received. Ben Aaronovitch currently resides in London and says that he will leave when they pry his city from his cold dead fingers. 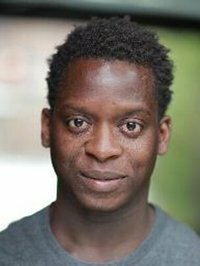 About the Narrator: Kobna Holdbrook-Smith is a Ghanaian-born, British actor who has appeared on stage, screen, and television, including Sorry, I’ve Got No Head, Little Britain, and Sirens. A graduate of the Guildford School of Acting, he won a Manchester Evening News Theatre Award for Best Actor in a Supporting Role for his performance in Ma Rainey’s Black Bottom. His audiobook narrations include Blue Remembered Earth by Alastair Reynolds and The Memory of Love by Aminatta Forna.